Navratri has come to an end and with that so is all our festive excitement. However, this disappointment won’t last long because the next festival is one of the most celebrate Hindu festivals of all time. This is a festival of lights that will in ever true sense lighten up your mood. We are talking about Diwali that falls on 19th October this year. People have already begun their preparations that includes buying firecrackers, new clothes and not to forget preparing delicious sweets at home. Just like any other Indian festival, even Diwali is a lot about preparing sweets at home and exchanging it with friends and family as a part of celebrations. And this time we will tell you about a delicious sweet that is one of the most popular Diwali specialties. 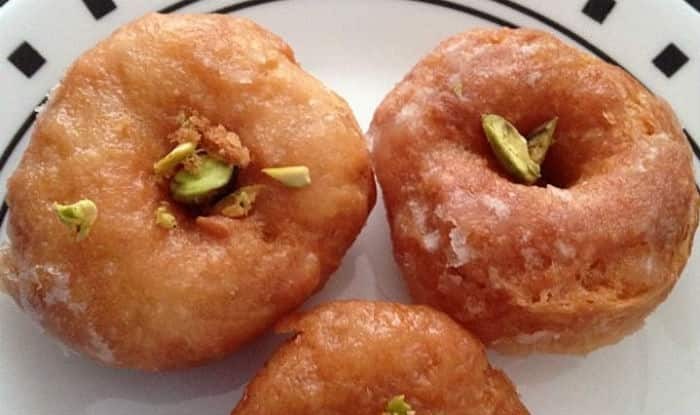 Make Badusha Balushahi at home with this easy to make recipe that was shared by Vahchef. Make your Diwali special this year by making Badusha Balushahi at home and call your friends and family over for a festive get together. Take a bowl add maida,cooking soda,baking powder mix well then add ****er or dalda crumble it. Now add curd and mix well keep it aside for 10 min. After 10 Min take the dough mix till the dry powder or maida is absorbed, now take the dough like small dumplings make a round shape, in the middle make a dent or Hole. In a pan add oil to fry balushahi deep fry in a very slow flame till light golden color. Then add the same to sugar syrup dip for 2 min and remove. Your Badusha Balushahi is now ready to serve. You can also watch the video of how to make this delicious dessert recipe step by step.